Down 57-48 with 16 minutes left in the game, Pitt decided that yes, they did want to keep that #1 seed in the NCAA tournament possible and outscored Marquette 42-18 the rest of the way en route to a 90-75 win at the Pete. That's 20 in a row at home and 14 wins in the conference, a school record. 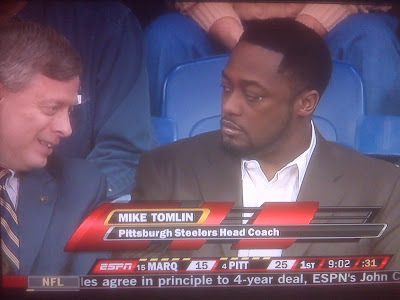 Mike Tomlin was clearly impressed. Or perplexed at whatever Mark Nordenberg was saying. 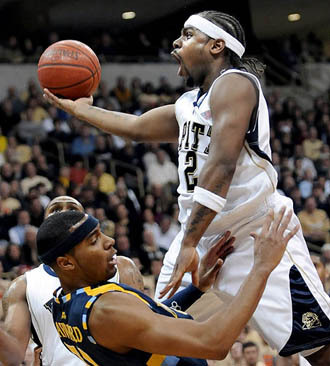 Pitt moves to 27-3 and has just one game left: a Saturday meeting with UConn at the Pete, with a noon tip. Better go easy on Friday night so you don't sleep through that one, you party animals. Remember, Pitt can still take the Big East regular season championship with a win over the Huskies and a Louisville loss Saturday at West Virginia. Former Panther Brandin Knight got his jersey retired before the game. It's only the fourth time Pitt has retired a player's jersey, with Don Hennon (1956-59), Billy Knight (1971-74) and Charles Smith (1984-88) the only others in that exclusive club. 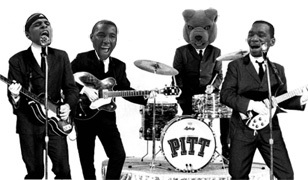 And one last thing: any Pitt fan will want to listen to Dave Dameshek's "Strawberry Fields" Pitt basketball song. I didn't know Blair could play the guitar, too. He CAN do anything. 50% of the jerseys retired by Pitt have been for a player named Knight. I am sensing that should be a top priority for recruiting each year.